The Packers “got the band back together” this week as the team began it’s Organized Team Activities in Green Bay. These first practices are the first chance for Packers fans to see the new roster in action. There’s lots of excitement around this summer’s work. Fans are going to get to see a lot of new things. Julius Peppers is new. HaHa Clinton-Dix is new. The defense is supposed to be new(ish). There is a lot to get excited about. My favorite part of these summers is competition. I believe that the best way to develop good players is to have open competitions for playing time. Just because a team isn’t “set” at all 22 positions doesn’t mean that it isn’t good. With the salary cap structure the way that it is, it’s impossible to retain all 22 starters every season. This offseason I’m going to take a look at the top 5 summer position battles going into the 2014 season. 1. Tight End– I’m completely enthralled by this entire position group. I don’t honestly think that any of the players on the roster are 100% safe, and I feel like everyone (including Jermichael Finley) outside of Jake Stoneburner has a legitimate shot at making the team. I’m not sure if the team is going to keep 4 or 5, but the addition of Colt Lyerla and the possibility of Jermichael Finley returning to the fold makes this the most intriguing position on the roster. 2. Center– Once again the Packers have decided to let a starting center go rather than pay out a long term contract. Evan Dietrich-Smith signed with the Tampa Bay Buccaneers and like Scott Wells and Jeff Saturday before him left the Packers with a new starting man in the middle. Most Packers fans assumed that last year’s 4th round pick JC Tretter would be the starting center this season, but the drafting of Ohio State C Corey Linsley in the 2014 draft creates competition. Other names mentioned in the conversation about the position (that I don’t buy into) are TJ Lang and Don Barclay. 3. Wide Receiver Behind Nelson and Cobb- The Packers are more than likely going to field at least 3 receivers on the majority of their snaps this season. They’ve grown accustomed to using 3 wide receiver sets in the McCarthy era and have been very effective using receivers out of the slot to create mismatches. We know that in these sets Randall Cobb is going to be the slot receiver and Jordy Nelson is going to be outside. Most would assume that Jarret Boykin (who acquitted himself well) would slide into that other position on the outside. That notion could certainly be challenged by an infusion of very talented rookies in Davante Adams, Jeff Janis and local legend Jared Abbrederis. 4. Dimeback- One might consider analysis of the 4th cornerback position to be a bit obsessive (and one might be right). The thing is one of my favorite young players on the team, Micah Hyde, is now in a questionable situation as to where he is going to find playing time. This phenomenon is addressed by our very own Adam Czech here. Davon House is also entering a contract year and I count myself among a number of people that believe he is capable of being a starting boundary corner in the NFL. Tramon Williams’ contract is up after this season and it’s not crazy to wonder whether or not the winner of the dimeback competition this year will be a starter across from Sam Shields in 2015. Given that the Packers play primarily nickel (and considering how effective Casey Hayward is as a slot corner) the winner of that competition could be a major defensive contributor for the Packers down the road. 5. Defensive Line– I am almost certain that the team will not carry 8 defensive linemen and one on the PUP again this season. I think it was a brilliant move last season to keep guys that would have a chance to contribute to this year’s team under contract. It’s been pretty well decided that BJ Raji will move back to nose tackle. Who starts along-side him is interesting. I think the team (and I) expect Datone Jones to be one of the linemen. 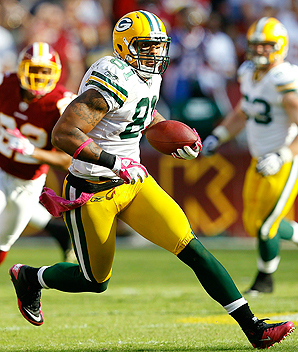 Jones was the first true 5-technique that the Packers invested in since the move to the 3-4. The other position might go to Mike Daniels, but it is an interesting question whether or not someone who is 6’0″ tall playing the 5 tech. I think it might all end up being irrelevant because between the 2-4-5 nickel that the Packers play almost exclusively and some of the new 4-3 under concepts that the team will utilize the 3-4 base defense might not be all that important. Be sure to stay tuned every Friday for in-depth breakdowns of each of these competitions! This entry was posted in Packers 2014 - 2015 Season and tagged Center, Colt Lyerla, Corey Linsley, Off Season, Position Battles, Tight End. Bookmark the permalink.